This is a perfect cake. The crunchy top compliments very well with the soft cake texture. Worth trying. Put sifted flour in a bowl, add in all the ingredients and mix using fingers to rub-in. It should resemble bread crumbs. Place the mixture in the fridge. 2. In a bowl, mix whipping cream (A) with dark chocolate, sit the bowl over a pot of hot water, melt the chocolate slowly over low heat. 3. Soften butter at room temperature. Add in sugar and beat until light and pale. 4. Add in vanilla extract, add in one egg at a time, beating well after each addition. 5. Mix baking powder with cake flour. Take half portion of flour mixture, add into the egg mixture and mix to combine well with plastic spatula. 6. Add whipping cream (B) into the batter (step 5) and mix well. Add in the remaining flour mixture and mix to combine well. 7. Scoop up 1/3 of the batter (step 6) into another mixing bowl. Mix well with chocolate mixture (step 2) to make chcolate batter. 8. 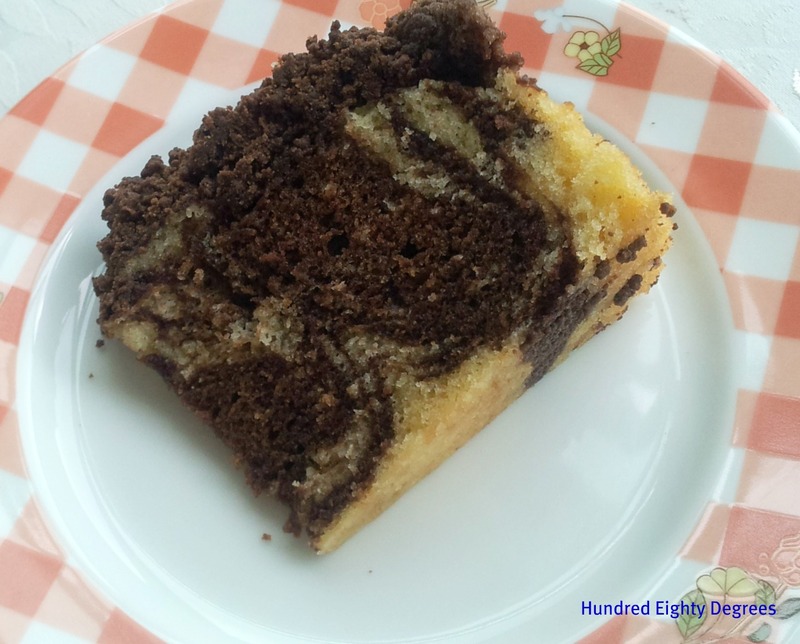 Pour the plain batter into the cake tin, then add in chocolate batter, lightly swirl the batter with a spatula to make marble patterns. 10. 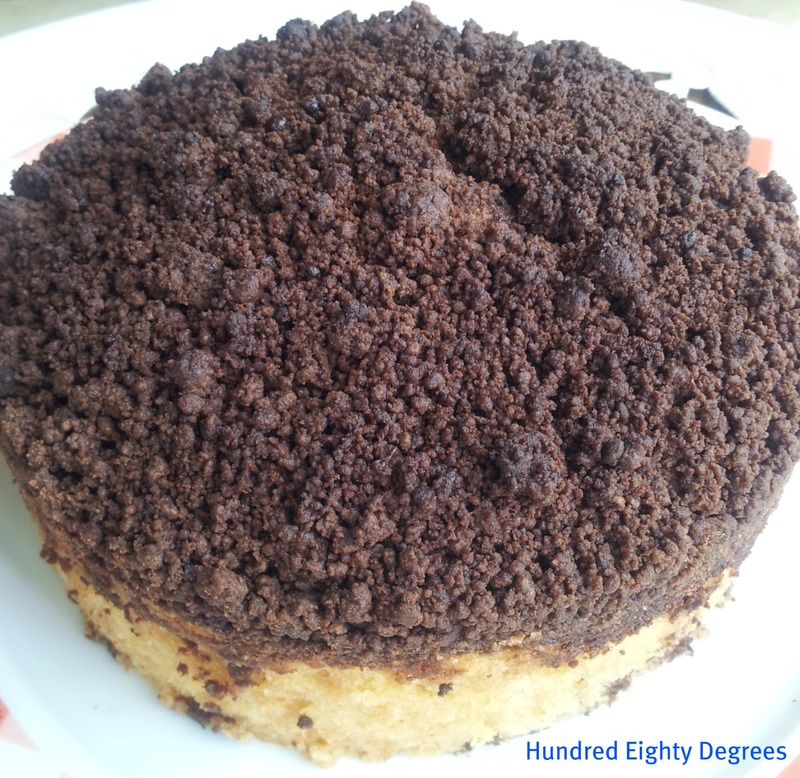 Remove cake, evenly coat the top with crumb topping. a cake full of deliciousness! i see others joining you for coffee, dont forget me too! This crumb cake looks really good! The texture looks soft and moist, perfect with the crumb topping! Coffee or tea with this? For me, definitely coffee, black please! Already feel like having a slice now! 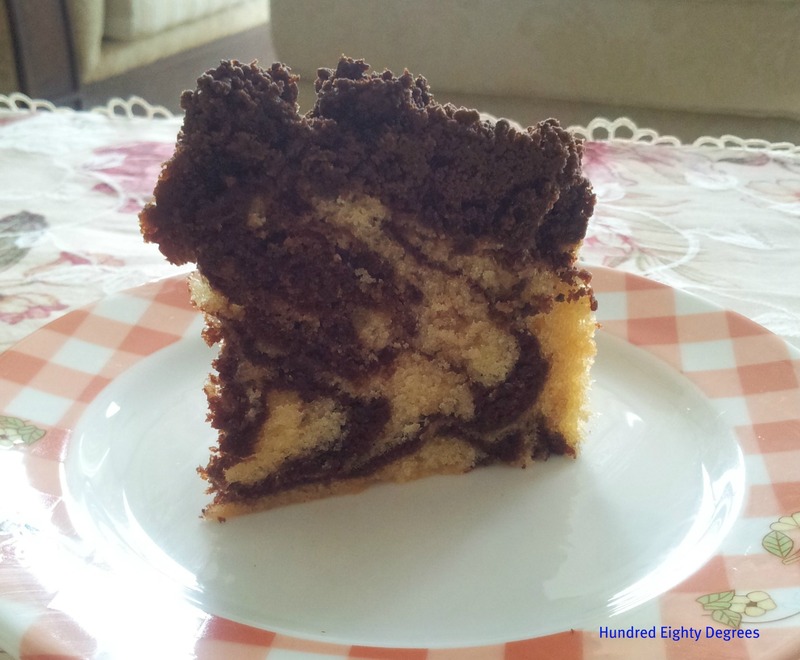 Hi Eileen, your marble cake look nice, I like the marble effect and especially the topping. Very tempting . Thanks for your compliment! Have a nice day. The topping is a plus point to the cake. Have a nice day!